At 11:00 on the morning of April 3, 1925, a three-motor biplane droned into the skies over Kinshasa. The cream of colonial society was waiting and a band struck up strains of the Belgian national anthem, “La Brabanconne”. The aircraft, a Handley-Page, nicknamed “Princesse Marie-Josée” left Brussels in mid-February and completed its journey under the command of Lt. Thieffry in 75 hours of flying time (over 50 days). 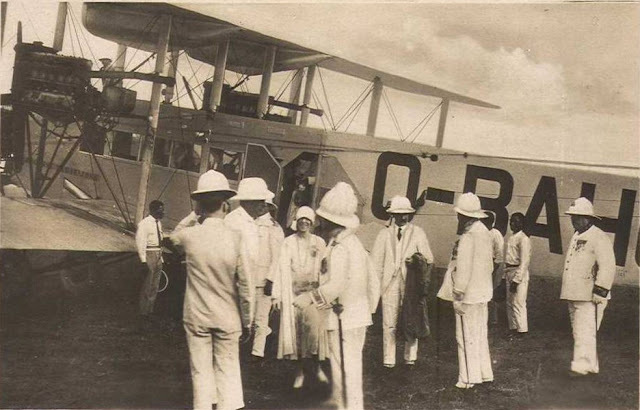 This audacious effort was the beginning of SABENA’s colonial service (the colony had contributed 25% of the capital when the new Belgian airline was created in 1923). Three other aircraft were shipped by sea. Over the next two years, SABENA would establish 80 air links within the colony. 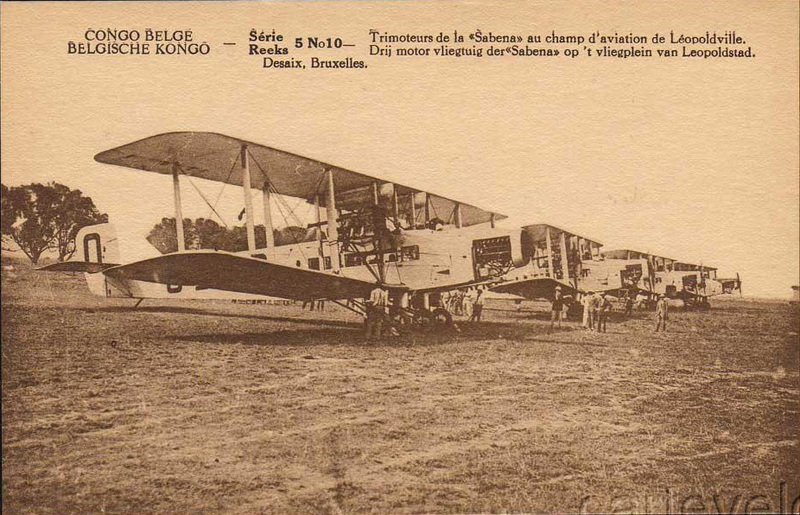 SABENA was created two years earlier out of a consortium that had tried to launch air service from Leopoldville to Stanleyville (Kisangani) using World War One-era flying boats (See. Feb. 24 2012). Three weeks after the “Marie Josée’s” arrival, SABENA launched service to Luebo in Kasai as part of a planned route linking the capital at Boma with Elisabethville in Katanga province. The flight took 6 hours and 45 minutes and carried 5 passengers and 195 kilos of mail. 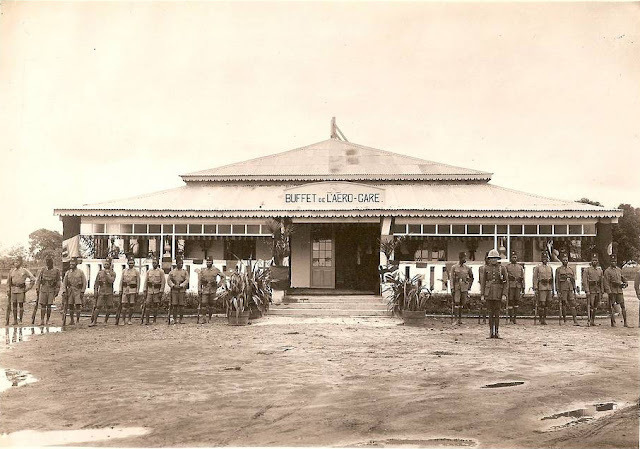 The aerodrome was located on 100 hectares at Ndolo, “a few miles out of Leopoldville”, with a 33 by 40 square meter hangar, brick buildings with an office, staff quarters, and fuel storage. On the first anniversary of Thieffry’s flight, a commemorative plaque was installed at the Sabena building at the airport. In 1926, service to Boma began and the following year the connection with Elisabethville was completed. Emergency landing strips had to be built every 30 kilometers along the route. Regular flights to Coquilhatville on the Congo River were inaugurated in 1928. During King Albert’s visit to the colony in July 1928, he flew in the “Marie Josée” to visit the diamond mines at Tshikapa. The next challenge was to bring Congo within flying distance of Europe. On December 15, 1930, aviators Vander Linden and Fabry landed at Ndolo in a Breguet-19 bi-plane. 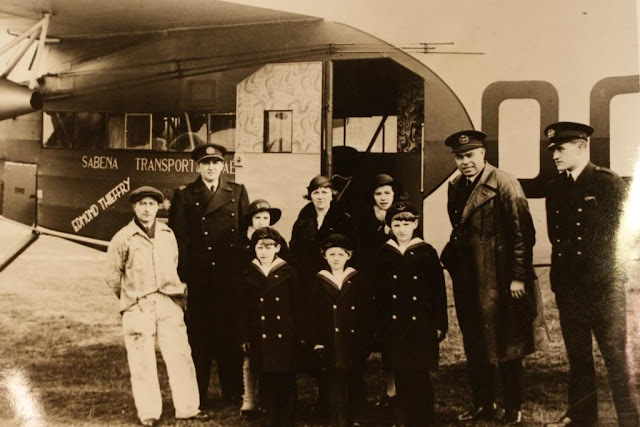 In contrast to Thieffry’s six-week odyssey, Fabry and VanderLinden’s flight took only 8 days. The flyers returned the next day to Brussels, having proved the feasibility of the link. I reported previously (See. Jan. 6, 2011) that the airfield was relocated from Kalina to Ndolo at this time, based on Marc Pain’s comprehensive study of Kinshasa. 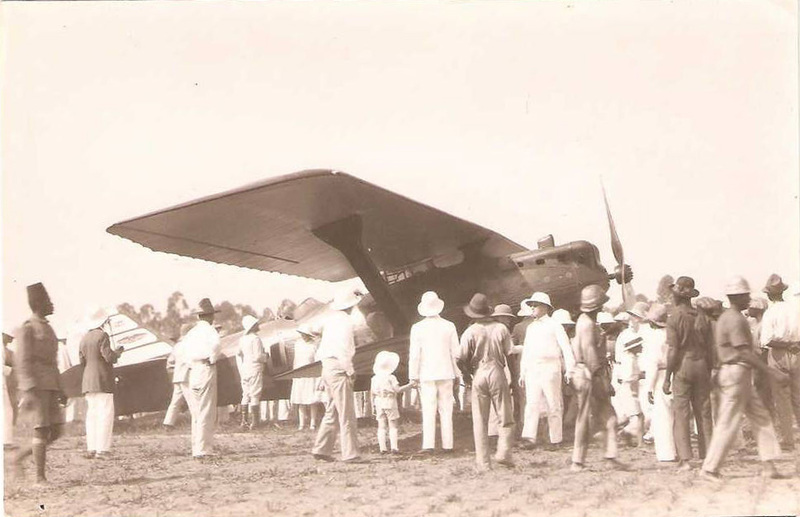 This would be consistent with the need to develop Kalina as the new colonial administrative center, but subsequent research has confirmed that an airstrip was in use at Ndolo as early as 1925. If both are correct, it would suggest that landing strips could be laid out here and there without constituting an airport. The next transcontinental flights were more of a record-setting nature as further development of air travel between Congo and Europe was limited by the Depression and Sabena was actually cutting back service rather than expanding. 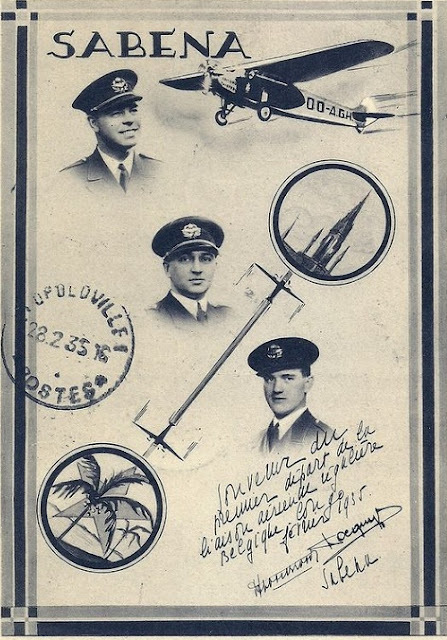 In March 1934, aviator G. Hansez and his wife made a mail run to Congo from Antwerp in five days, but this was not expected to become a regular service, as Sabena held the mail contract. 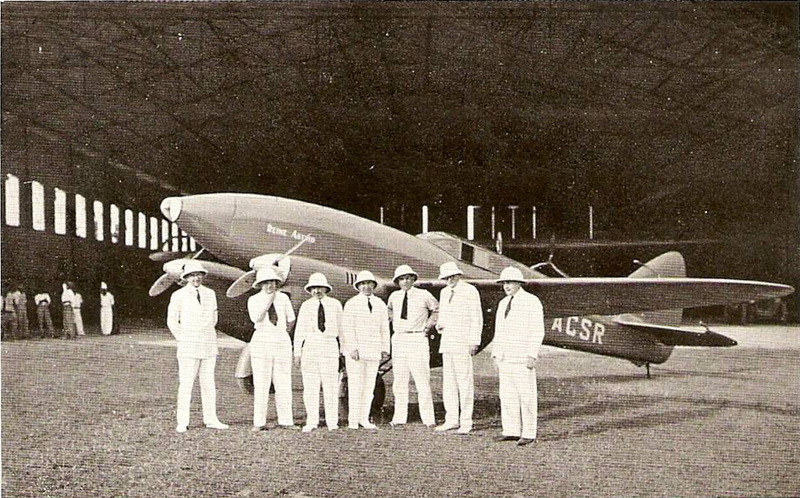 In December 1934, Waller and Franchomme delivered the Christmas mail in less than four days in a DeHavilland DH-88 Comet race plane named for Queen Astrid. ﻿﻿SABENA inaugurated regular passenger service from Europe in February 1935 with the arrival of the Fokker F-VII tri-motor. 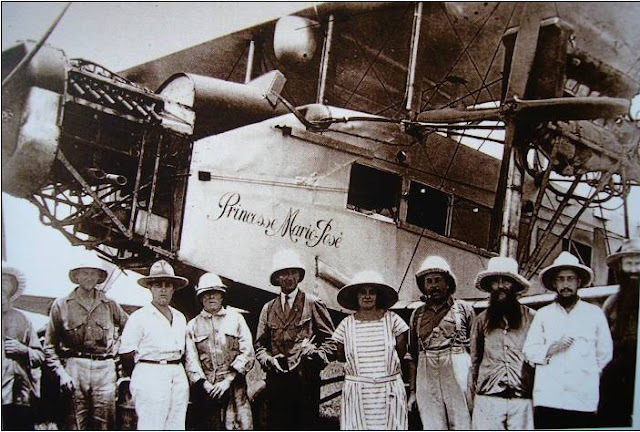 The plane, named “Edmond Thieffry”, carried a crew of three and a passenger, Tony Orta, SABENA’s director of operations in Africa. 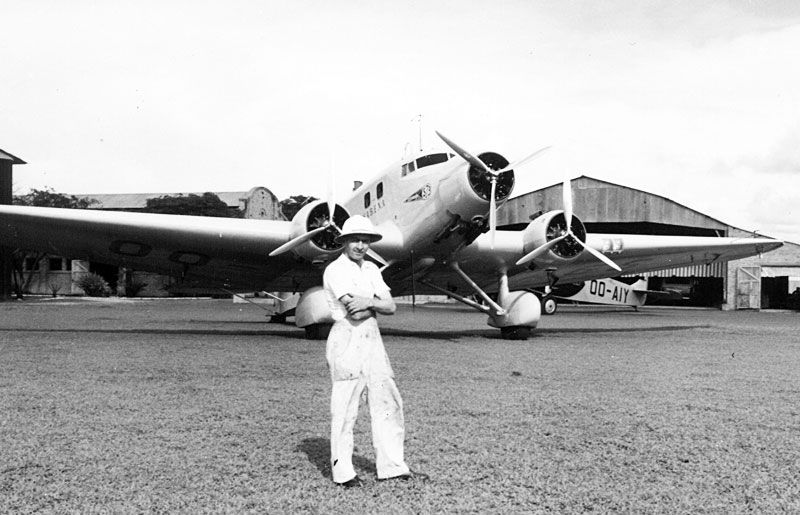 Orta had served in the colonial air force as a young aviator in the campaign against the Germans on Lake Tanganika during World War I. By 1937, with operations well established, SABENA built a Guest House between the airport and downtown to serve its transit passengers (See March 29, 2011). 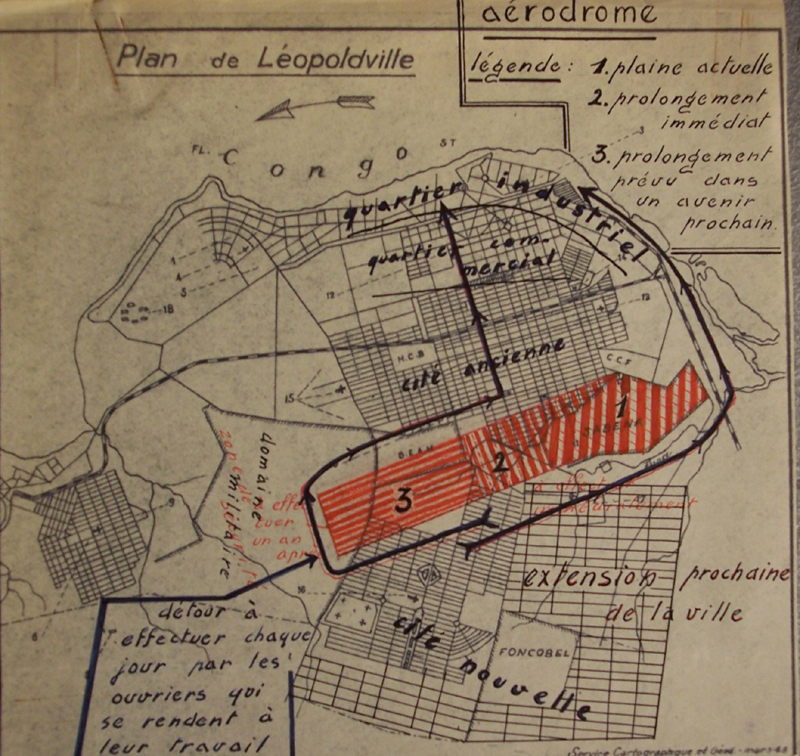 By November 1938, Sabena had completed 100 flights between Belgium and Leopoldville. In December of that year, the Council of Ministers discussed acquiring new aircraft for SABENA, considering the relative merits of the Junkers JU-52 and the American Douglas DC-3. The German-made Junkers was cheaper, and while outdated, it could be used effectively in Congo. The Council opted to order two DC-3s for use in Europe. The crew of the Fokker F-VII "Edmond Thieffry"
The German invasion of Belgium in May 1940 cut the colony off from regular air service with Europe. SABENA, considering war in Europe inevitable and with Belgium surrounded by belligerents, had already transferred the European terminus of its African service to Marseille during the “phoney war”. At the same time, unable to continue service to Europe, SABENA joined in the war effort, ferrying personnel and supplies along the West Africa-Cairo route established by the Allies, as well as service to Johannesburg and Cape Town via Elisabethville. 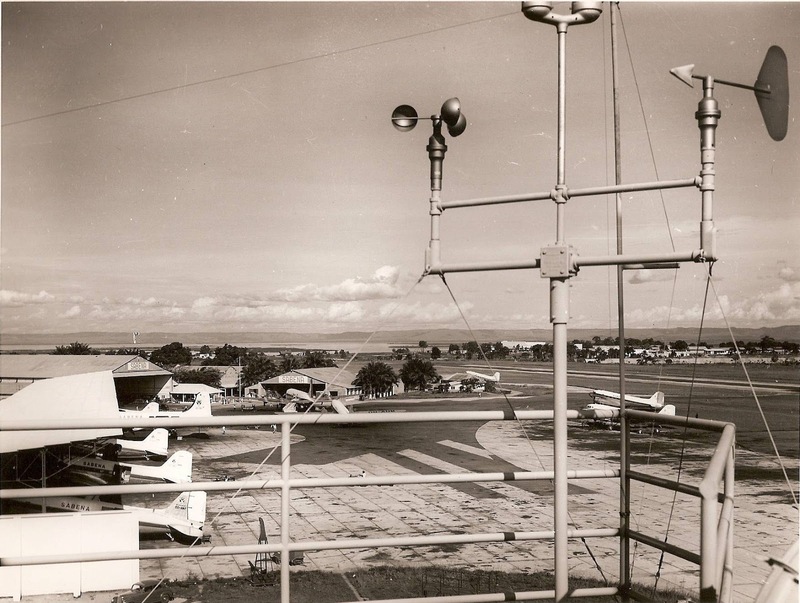 Serving domestic and international flights, Ndolo airport was a key hub in the African air network. In March 1941, Tony Orta and Gaston Perier transferred the remainder of the SABENA fleet from Marseille to Leopoldville, establishing the airline’s headquarters in Congo. The airline operated three types of tri-motor planes; the Fokker V-II, Junkers 52 and Italian-made Savoia-Marchetti 73. By the end of the year, SABENA was consolidating its operation, obtaining a building permit to rehabilitate four houses near the airport to accommodate its staff. The arrival of the Pan American Clipper flying-boat in December 1941 (See. Feb. 20, 2011), suggested a water-based landing mode might predominate (BOAC flying boats were also serving Leopoldville between West Africa and Egypt), but the importance of a landing field was critical for new aircraft designs coming into production and plans to use Leopoldville as a refueling stop on the ferry route for fighters to the Middle East. Initially, the Allies considered the airfield at Pointe Noire in French Equatorial Africa (now Congo Brazzaville) as key to the West Africa–Egypt route, given the ease of delivering fuel at the ocean port. 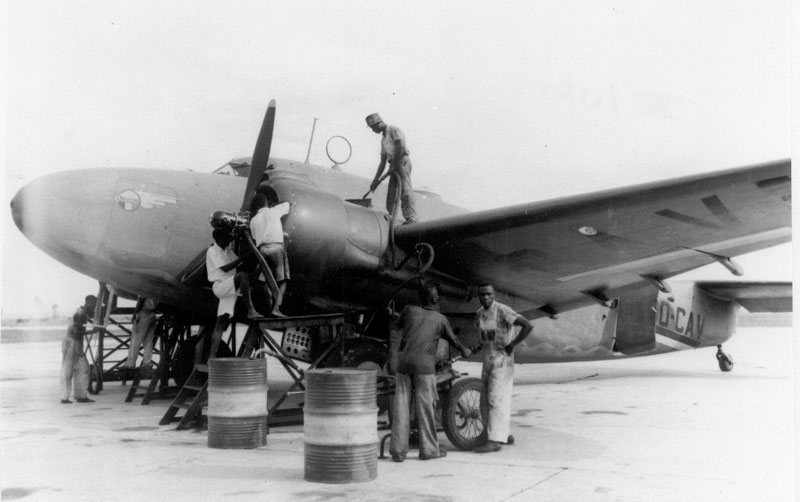 In April 1942, the US obtained access to the Pointe Noire airfield in exchange for 8 Lockheed bombers. 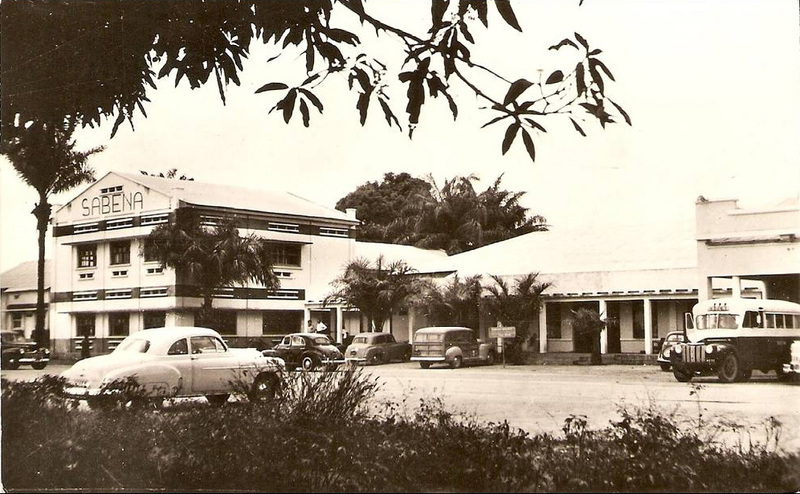 At the same time, the US Government agreed to open a Consulate in Brazzaville, which was previously served by Leopoldville (See. Jan. 29, 2011). By July, the French were still holding out for more benefits, claiming the US base would make it a target for Axis retaliation. Exasperated by the vacillating attitudes of the French, the US Army decided to establish its Central African base, including hospital, post office and other support facilities at Leopoldville. At the end of the month, frustrated with French intransigence and impediments over unloading, US Army Engineer Capt. Vann ordered the SS “Calhoun” carrying the US expeditionary force from Pointe Noire to Matadi. Pointe Noire would only be a refueling station (See May 23, 2011). The U.S. engineers completed the construction of Ndolo airport in record time. The runway was extended to a length of 2,300 meters and 30 meters wide. Throughout the war, Sabena’s domestic service expanded significantly to meet war needs. In addition, the company contracted with the British Air Ministry of to operate air service between Takoradi in Ghana and Juba in southern Sudan. 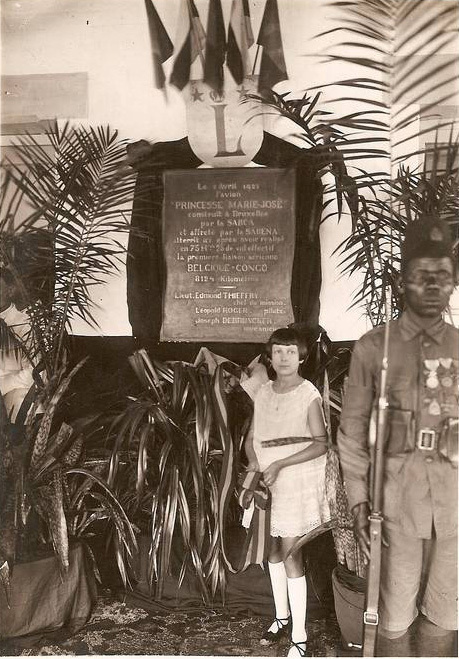 This line primarily transited to the north of the colony through Coquilhatville and Stanleyville rather than Leopoldville, but a Leopoldville-Lagos link established July 1940 across French Equatorial Africa was an important Allied service. By the end of 1943, the Belgian Council of Ministers began to look at reopening service to Europe. Since Belgium was still occupied by Germany, the flights would have to go through Britain. Congo was concerned not to ruffle US feathers (which also operated the flying boat line to Congo), as the US had done so much to improve Ndolo airport and was Sabena’s main supplier of aircraft. 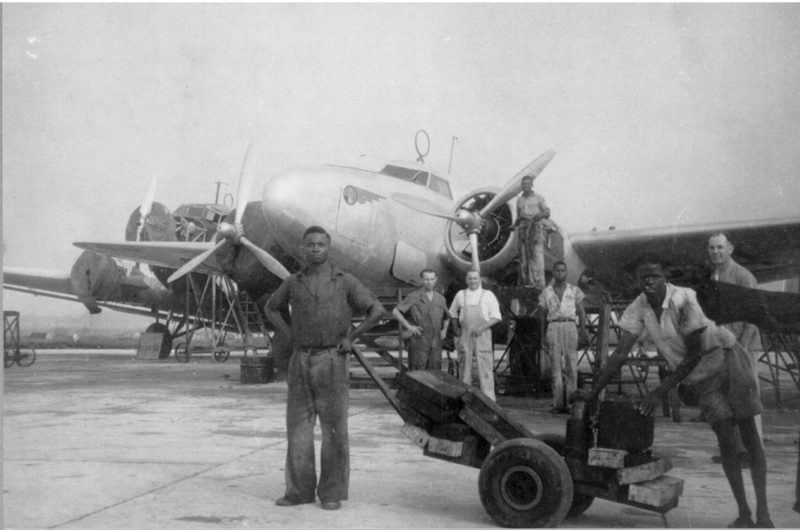 During 1944, Sabena received 5 Lockheed Lodestar aircraft for its Africa service and ordered 4 Douglas DC-4 airliners. On September 13, 1944 a Sabena Lockheed Lodestar reopened service to Europe via Lagos, Casablanca and Lisbon. In February 1945, Sabena began flights to Paris, and passengers could continue to Brussels by train. Finally, on July 8, the first direct flight to Brussels left Ndolo airport. The Lodestar carried 15 passengers, including Sabena’s Vice President, Gaston Perier. But the era of the Lockheeds, Junkers and Fokker F-VII was passing. On January 16, 1946 the first Pan American DC-4 arrived at Ndolo (See May 23, 2011), followed the next month by SABENA’s first DC-4. In July, Air France inaugurated Paris-Leopoldville DC-4 service until the Brazzaville airport could be upgraded to handle the larger aircraft. Sabena introduced the Douglas DC-6 in 1947 and Pan American and KLM began using Lockheed Constellations. Construction of control new tower was launched in September 1949. 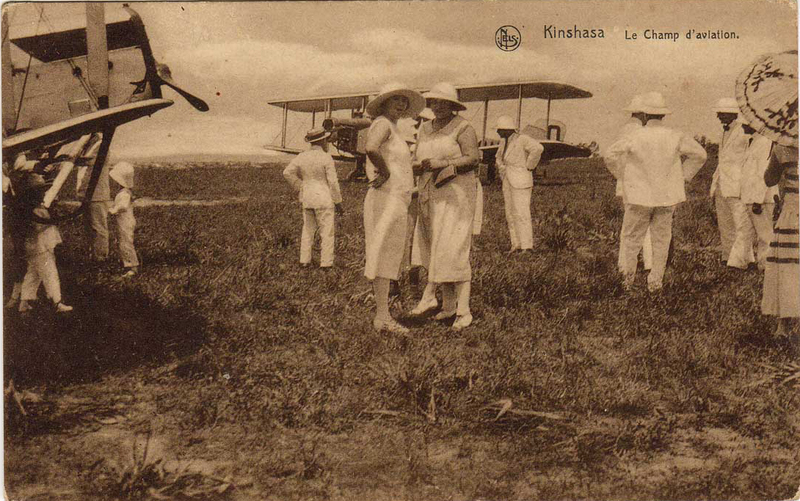 The same year, the Force Publique established an air base for its Aviation Militaire at Ndolo. The big passenger planes required a longer runway, and the impracticality of extending the existing Ndolo strip into the cité led planners to look for a new site. Initially, plans were developed to build a new airport at Lemba, approximately where the Lumumba monument and FIKIN are now located (See Aug. 20, 2011). Costing 7 million pounds, it was to be the largest airport in the world. There were concerns that the new airport would constrain the growth of the city while others felt that Ndolo airport could adequately handle the traffic. Eventually, a site for a new airport was identified at Ndjili and work commenced on a facility that would have the longest runway in the world. 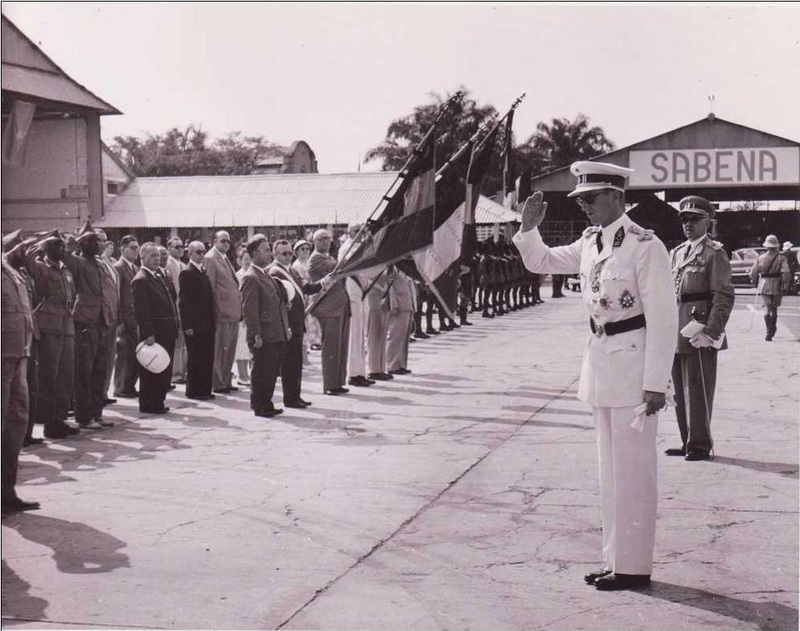 In preparation of King Baudouin’s visit in 1955, however, a major upgrade of Ndolo airport was completed including construction of a large hangar and technical block, new pavement, offices and storage facilities. Construction of the new airport at Ndjili began in 1954. When the first Sabena Douglas DC-7 landed at Ndolo in January 1957, it had to fly to Ndjili to refuel for its return flight to Belgium because the aircraft would have been too heavy for the short runway. 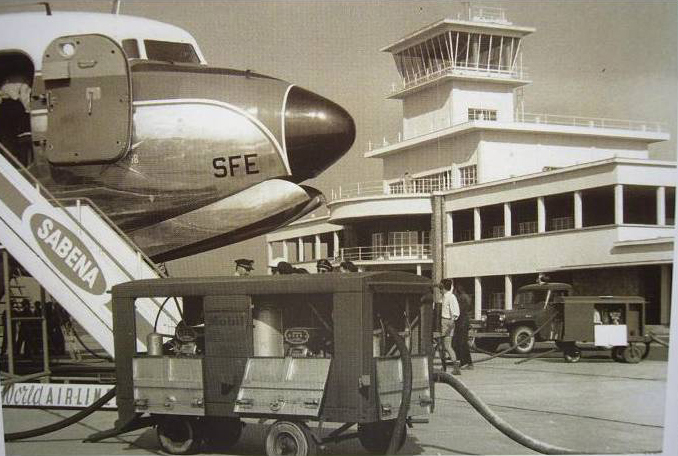 In February 1959, the new International Airport opened at Ndjili. 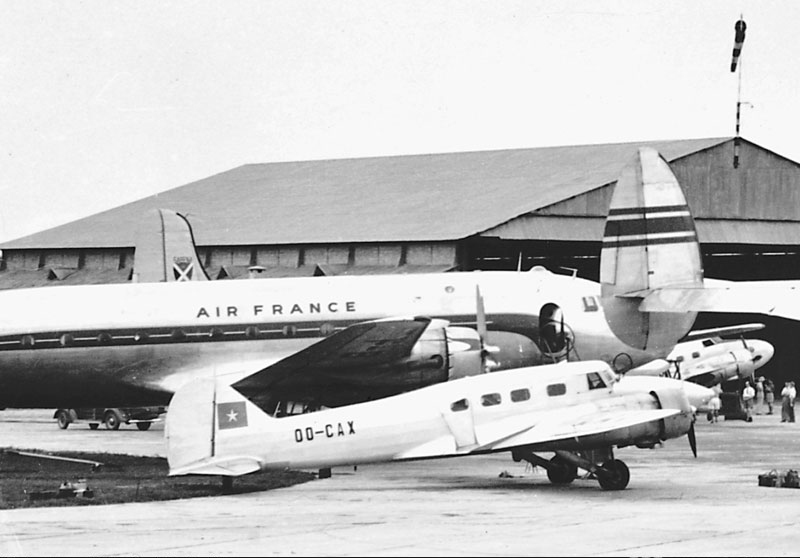 Sabena and Pan American were the primary carriers. Our family marked this transition, flying out of Ndolo aboard a Pan Am DC-7 Clipper in 1958 and returning to Leopoldville in 1959 to land at Ndjili. · Ferry, Vital, 2005. Ciels Imperiaux Africains, 1911-1940, Le Gerfaut. · Flight, Nov. 26, 1925. · Foreign Relations of the United States.1942, Vol-II, p.570-84. · Pain, Marc. 1984. Kinshasa: La Ville et la Cite. Eds. de l’ORSTOM.